In July, Google announced its plans to shut down iGoogle, its personalized homepage that users customized with gadgets of their choosing, including things like Twitter updates, shopping lists, calendar appointments, news feeds, weather, and more. There was a surprising amount of backlash at the time – apparently, some folks out there were still pretty reliant on having a one-stop-shop portal as their starting point for “surfing the net.” (Hey, I figured I’d throw in some old-school web lingo if we’re talking about something as dated as personalized homepages here.) Case in point: this comment thread where folks complained about the iGoogle loss. So what’s a former iGoogler to do? Well, believe it or not, there’s a new startup that wants to bring back the personalized homepage. 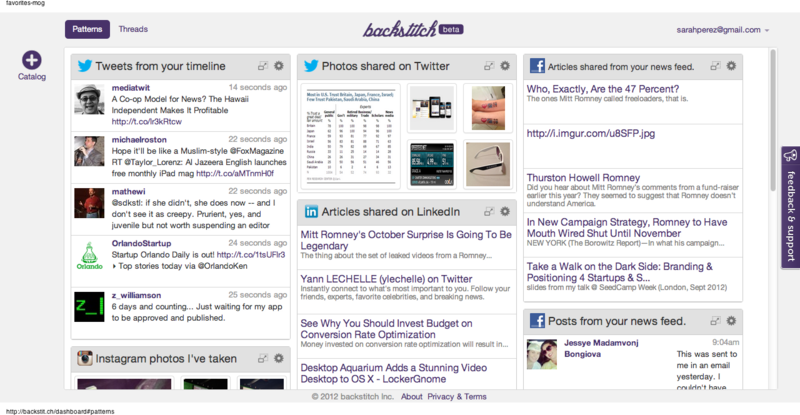 Meet Backstitch. “What frustrates us,” explains co-founder Jordan Warzecha, who created the site alongside wife Stefanie, “is how complex our daily internet routine has gotten; a ballet of flipping between tabs to get our news fix, managing our social feeds, and skimming the constant daily deals.” So they created Backstitch to help. As you can tell by the pain point being described here, there’s not really a “new” problem to solve. It’s exactly the same issue that personalized homepages always sought to address: information overload. But unlike some previous attempts in this space (Netvibes immediately comes to mind), Backstitch users personalize the content, not the design of the website. Jordan says he and Stefanie were inspired by the “clean web” movement when building Backstitch. (See also: Svbtle and Medium as other examples of this). On Backstitch, users can add content from around the web including social services like Facebook, Twitter, Instagram, LinkedIn and even App.net. Plus they can add deal sites like Woot and Groupon, feeds from news sites and blogs, and more. The service also uses something they’re calling “semantic labeling,” which converts the web content into consistent formats so articles, photos, status updates and products are all displayed using a similar interface. Jordan tells us that this technique allows them to render the content using a standard user interface toolkit, and it allows for personalized filtering, as well as the ability to pipe info from one service to another. While I haven’t found personalized homepages to be all that useful in days past, generally preferring the full web or app experience provided by the individual services themselves, I can also see where Backstitch could easily fill the void left by the departure of iGoogle and the like. Backstitch’s co-founders are based in the Detroit area and have previous experience in software development. However, they’re new to launching their own startup. 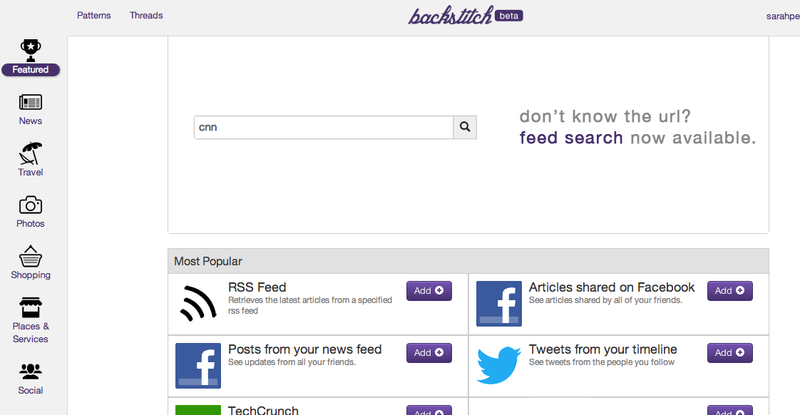 Backstitch is currently in bootstrap mode and available as a free beta service. Correction: Originally stated that iGoogle was shut down in July. Shutdown was announced in July but service will remain up until next November.